You can’t have “mountain majesties” without purple! I really enjoyed doing this one. There are issues with it, but I was pleased with the sky and I enjoyed the color gradations. I may work on a value scale tomorrow. I’d like to improve the tonal values in my paintings. The inspiration for this painting was a painting of the Blue Ridge Mountains that I found on p. 15 of “The Art of Perspective” (which I really need to spend more time reading!). That area will always hold a special place in my life and heart, as it hosted (part of) our honeymoon and also our 25th anniversary. I wish each of you a happy, peaceful, majestic Sunday. Walk in yellow light. < Look what Hub brought in! I love the North Carolina Mountains along the Blue Ridge Parkway. This is a great little painting. A little practice on value scale is always worth doing. I find I am constantly in need of practice there in whatever medium I play with. Keep up the good fun. Thank you so much, Richard. North Carolina is certainly a gorgeous place to be, mountains or coast! Thanks for your comment; glad you enjoyed this one! ….it is another lovely rendering, Laura. The clouds and sky are so perfect above that last, almost-not-there ridge. Thank you, Lance. I’ve been working on skies and getting frustrated but I tried a little easier on this one, and I think that may be why it worked out. I always appreciate your feedback. Have a great Sunday! Laura you have created an amazing depth of field in this artwork. beautiful colours. Thank you Denis! I’m really glad you like it. Purple is one of my favorites. Have a great day! So beautiful! Funny….we spent our honeymoon and 25 year anniversary there also! Great capture! Thanks so much, CAS! It’s such a gorgeous area. Were you in VA, NC, or both? Awww thank you! NC is part of my soul. Mountains and beach. Do you guys visit the Outer Banks? I totally agree!! Lots of people seem to retire there. Thank you so much, Sue! I do appreciate your comments and visits. Happy creative Sunday to you! Thank you, Ann!! I’m so glad you like it!! I ordered Charles Reid’s landscape DVD today…..he paints on the British coast, in Suffolk. I can’t wait. That subscription service doesn’t have access to that one. But I’m hoping I can so seascapes after watching!! Do you ever paint the sea? Not really until now, I find it quite hard and challenging… My attempts looked always only quite boring, don´t know why… But it´s a good idea, I´ll try that after the Draw-A-Bird-Day birdies! Oh Laura. You made it look so effortless. I am so impressed with the way you are tackling this and learning about depth and tone. I must study more. I just slap paint down. Not very respectful of the art. 😕. I am learning more with your journey. Thank you. Laura–Nicely done. I like the clouds capping it all off as well. The more I look at it the more I see the mist pressing up from the hollows. Thank you! You wouldn’t believe how easy that is to do. If every painting were like this one, I think I could make a go at this. 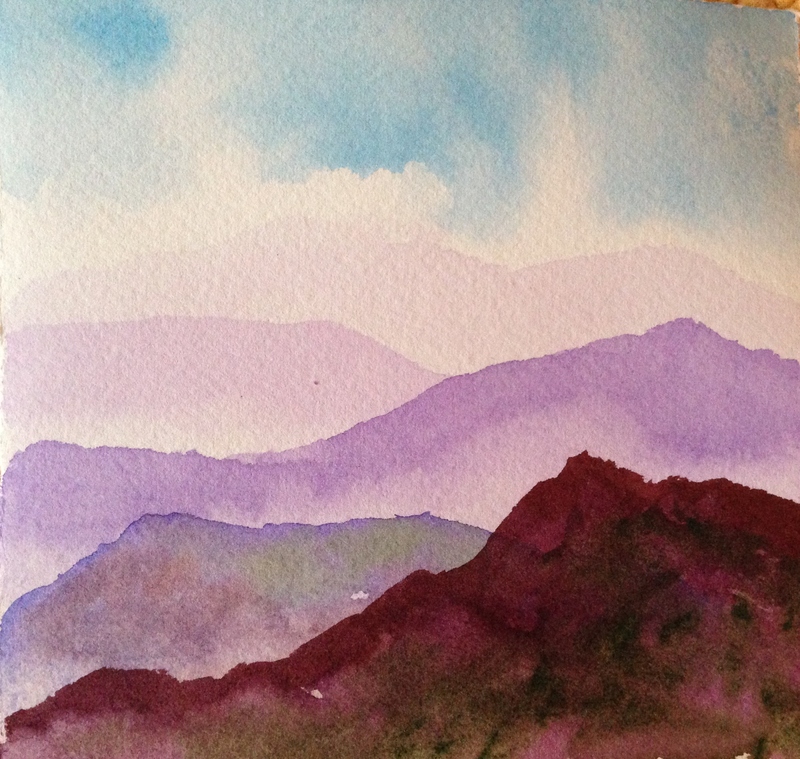 If you google “blue ridge mountains watercolor youtube”, you’ll find a tutorial that’s about 7 minutes long that shows how easy that mist is to do! I had no idea. And it really does look like the mist in those mountains. Youtube is great. Now you got me, because that mist is wonderful. Beautiful scene Laura – you give us wonderful distance as you balanced the values and moved us to the back mountain range. Real nice play on purples and magenta, with awesome cool blues in the sky. Gorgeous work on the clouds – great way to start my day. Thanks, Rebecca! I enjoyed this one. I’ll be curious what the coming weeks will bring. A beautiful painting! One of my favs of yours. Your sky in this is lovely, and I think you’re really understanding aerial perspective. Good work! Laura , this would be a wonderful painting to paint on a large scale. Your practice is paying off. Bravo! Wow, thank you Sharon! I really appreciate that! Thanks, Jennifer! :)) If I could do everything in purple, I would. I think I like this one better too…the extra layers and fading give it more depth. Although I like texture on the mountains of the newer one a lot too. It’s good to try the same thing different ways and compare. I agree, the extra layers were good. It needs more interest, though. I thought if adding a scraggly tree….but was afraid to totally wreck it. Baby steps. Thanks for your feedback on these! They really are amazing; I agree. Even just non-mountainous woods are wonderful! But there’s something special about the mountains. Thanks again, BB! Totally. Agree. The wooded areas out East are pretty spectacular as well, but mountains have a way of just feeding the soul. Yes. I am in Maryland, so those wooded areas definitely call my name! They really do feed the soul; I totally agree. Oops, I meant out on the West Coast. The most East I have been is to DC, and there isn’t much glorious woods in the city. Just beautiful buildings. lol, true. I could never live in a city, it’d crush my soul. Are you pretty close to the woods? I live in a small city with lots of lakes, We have some woods, but not the kind that I like to walk through. The lake walk/view is more peaceful. Laura this is beautiful, I find water colour a challenge. You have created an amazing piece. The mountains here go a deep blue/purple haze. You’ve captured what we’ve been seeing on our sailing trip on the Central Coast. Only of late with lots of haze from forest fires. The smell too! Thank you! I’m glad you’re enjoying them. I’m trying to paint a small picture every day; hopefully I’m getting a bit better! No doubt. Have you gone back to when you started? I for one can see how far you have come. Great work and persistence. the sky on this is very very good. I’d say do more just like or in the same free loose feeling! 🙂 also, your tonal value sequence and structure in the painting is really good, from back to front the tones are progressively getting darker. Great!! Thanks, Debi! I do like this one the best of the mountain scenes I’ve done so far. I’m practicing skies, trying to improve, and did something of a skyscape tonight that will post in about eight hours. There’s just a bit of mountain at the bottom of that one. I’m feeling more comfortable with getting depth with tonal contrast, but I’d like to add perhaps a straggly tree to these scenes for a bit more interest. Trees are a bit much right now, but the good news is I can always add a tree to a painting when I’m better at trees! Thanks as always for your feedback. Thanks, Margaret! I appreciate that! I enjoy mountain scenes.